You’ve gone through Thanksgiving dinner, Black Friday, and Cyber Monday. Now it’s time to give back. Today is #GivingTuesday, a day dedicated to the power of giving and encouraging people everywhere to contribute to causes they care about to better their communities and the world. And Power BI is providing a window on its momentum. #GivingTuesday is the brainchild of Henry Timms, executive director of the 92nd Street Y (92Y), a cultural and community center in New York City. Timms came up with the idea that after all of the consumption of Black Friday and Cyber Monday, what if we could think about giving back? That was four years ago. Today, more than 30,000 partners from 68 countries are expected to participate–corporations, nonprofits, churches, and community centers–all encouraging their patrons and members to join in and give. Microsoft was one of the first organizations to join the Giving Tuesday partnership. That’s hardly surprising. Microsoft’s own Employee Giving Campaign has raised more than $117 million for more than 20,000 nonprofits last year. It makes perfect sense to our colleagues at Microsoft Citizenship. Their goal is to grow goodness on a massive global scale to serve causes around the world more effectively. This year, Microsoft collaborated with 92Y and Blackbaud, which processes most of the #GivingTuesday donations, to provide the technology to turn large quantities of data into a real-time picture of the day’s progress. Microsoft helped 92Y set up a command center at its New York City facility, with Surface Pro tablets running Windows 10 and large touch-screen monitors that display a virtual dashboard of charts and graphics of key metrics created with Microsoft Power BI. In the Giving Tuesday command center, Microsoft and Blackbaud teams will give 92Y an unprecedented view of contributions using data from dozens of partner platforms. The idea is to help leaders take #GivingTuesday to the next level. 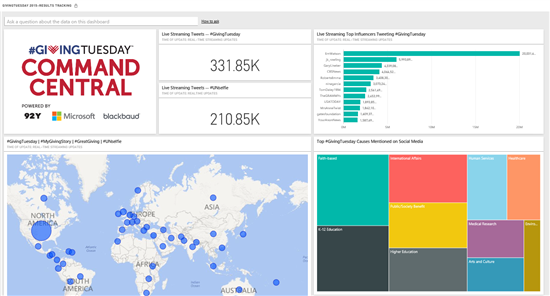 With its vivid visualizations, interactive dashboards, and real-time data updates, Power BI provides the #GivingTuesday organizers insights into donor locations, donation volume, social media influencers, and more—all in a single canvas. Such valuable, timely information could shape strategies and potentially make this the most successful #GivingTuesday yet. Power BI’s rich visual dashboard will give the 92Y team a live 360-degree view of what’s going on by bringing together data from multiple sources. If they see an approach that works well in one area, they can determine whether they can apply it in different parts of the world. They can build on that insight in real time, rather than waiting until the event is over to evaluate their campaign. In the nonprofit world, as with commercial organizations, managers have to solve the challenge of consolidating information that is siloed in disparate data sources. With Power BI providing pre-built dashboards and reports to data services, such as Google Analytics and Salesforce.com, the information needed to engage donors, make strategic decisions, and demonstrate accountability is all brought together in one location. Nonprofit professionals can then make sophisticated analyses and derive insights to make sound business decisions and demonstrate the value of their services to donors, funders, and the community. Microsoft understands the importance of bringing business intelligence to nonprofits, empowering them with the technology to help them do what they do best: creating good in the communities they serve. That’s why Power BI is now available to nonprofits through the Microsoft Product Donations program.